Over three years ago, I visited the Joya de Nicaragua factory in Estelí as part of Drew Estate’s Cigar Safari (Drew Estate is Joya’s distributor). At the outset of the tour, Juan Ignacio Martínez—then 31 years old and recently named executive president—gave us an overview of Joya’s fascinating history. Many know Joya is the oldest cigar maker in Nicaragua. Fewer are aware of how Joya’s legacy is intertwined with the political unrest in Nicaragua in the 20th century. When you think Joya, you probably don’t think of Anastasio Somoza Debayle, President Nixon, or the Revolución Popular Sandinista. You probably think of brands like Joya Red, Cabinetta, Cuatro Cinco, Dark Corojo, and—perhaps most notably—Antaño 1970. The Antaño blend (which translates to “yesteryear”) was crafted, according to Joya’s website, “as a tribute to recapture the power and essence of the puro that made this legendary brand the most sought-after cigar in the U.S. in the post-Cuban Embargo 1970s.” The blend is well-known to deliver a consistent, rich, spicy, full-flavored experience. Ten Antaño vitolas are available, including the Churchill (6.9 x 48), which I recently picked up at my local tobacconist for the very fair price of $7.45. It is handmade in Estelí with 100% Nicaraguan tobaccos, including a dark Habano-seed Criollo wrapper. Three cheers to Joya de Nicaragua for including the cigar’s name and dimensions on the cellophane (I wish more cigar makers did this). Once the Churchill is out of its packaging, the full features of the intimidating smoke can be more closely observed. The dry, coarse wrapper has a slight reddish hue with thin veins. It is accented nicely by the familiar, attractive band of gold, red, and green. The feel is moderately firm yet the cold draw is smooth. At the foot, you’ll find pre-light notes of dried fruit and damp earth. “Novices need not light,” warns the Joya website. This is no bluff. From the first puff, the Antaño 1970 Churchill is undoubtedly full-bodied, strong, and spicy. But to write it off as a mere heavy-handed powerbomb would be to miss the excellent, balanced flavors that comprise the profile. Attentive smokers will find green raisin, cedar, black coffee, black pepper, and cayenne spice. The texture of the thick smoke is leathery. And, despite all the power, there is a smooth creaminess to the overall delivery that makes the experience all the more enjoyable. There are no major changes in flavor throughout. All the while, construction is exquisite. Expect an even burn that requires zero touch-ups, a solid ash, clear draw, and above average smoke production. Joya de Nicaragua’s website claims “this is a cigar for the experienced connoisseur who appreciates and craves unadulterated boldness.” I am inclined to agree. The Antaño 1970 Churchill brings plenty of strength to the table, and it also delights with a rich, balanced profile that pairs excellently with bourbon or rum after a satisfying meal. If you want to get to the core of why so many cigar makers and enthusiasts have become so enamored with Nicaraguan tobacco, look no further than this fine specimen. It earns an outstanding rating of four and a half stogies out of five. This was probably the first cigar that really clicked for me back when I started smoking cigars over a decade ago. Previously, I had been smoking a lot of milder, CT-wrapped smokes recommended for beginners, but I actually think smoking more flavorful cigars is better for new smokers now. 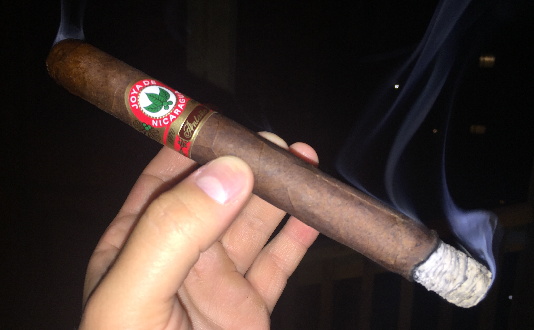 The Antano is still a gutsy, spicy smoke that I really enjoy every once in a while.